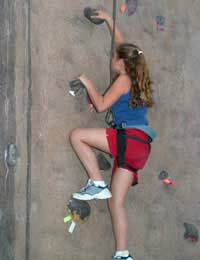 Indoor rock climbing on artificial walls has gained increasing popularity over the last few years. Facilities offering this type of climbing have sprung up all over the country and provide a safe environment where expert instruction is available so climbers can improve their technique and can practice moves that push them to the maximum levels of their ability. Your lessons will include learning different holds, how to tie knots, how to tie yourself into your harness and basic safety rules. Most Commercial facilities have instructors supervising novices on walls that are normally 4m or so above the ground. Crash mats are spread out below the bouldered areas, and on longer routes safety equipment is spaced out at frequent intervals, providing a safe and comfortable environment for learners. Equipment can be hired at these venues including harnesses and shoes and instruction is provided on safety and use of all equipment. The Indoor Climbing facilities also offer walls with different levels of difficulty, so all levels of climber can use them. Rock climbing is a vigorous and physically demanding sport and you need to have strength in the back, arms, hips, and shoulders. Although all efforts are made in indoor climbing to minimise the risks of accidents and injuries they can still occur and you should be aware of the best ways to avoid them. Although the hand holds on indoor walls are large and allow the climber to get a good grip while putting less pressure on the fingers, hand and finger injuries like strains are quite common in people new to rock climbing. Overuse of a body part in any sport can lead to injury and constant use of the hands, fingers and arms in climbing mean these areas are particularly prone to injury. Damage to tendons in the fingers (climber's Finger) can occur when the climber is trying to support his bodyweight with only one or two fingers. Inflammation of the finger joints, forearm muscle strains, strains and inflammation of the tendons connecting the forearm to the elbow joints are also common, because of supporting the body weight and from pulling the body up into position. Carpal Tunnel Syndrome is also prevalent in climbers and is a condition in which the Median nerve in the hand becomes compressed and causes numbness and pain. Learning and using climbing techniques that don't put too much pressure on one finger or hand at any given time can help reduce the risk of injuries. Taking significant breaks between climbs, giving your body a chance to recover properly can also play a part in reducing the risk of injury. There are many techniques that need to be mastered before you start a climb. Rock climbing should never be attempted, even indoors, without proper instruction. Make sure you get a harness that fits you properly. Your harness should be snug, but not too tight. Outdoor climbing is different from indoor climbing, and other techniques and skills like resting, and the correct placement of safety and protection devices in rocks need to be learned before the change from one discipline to the other can be made.